Leinster prop Marty Moore has undergone shoulder surgery and will be ruled out for 12 weeks after being injured in Saturday's victory over Zebre. Moore's injury means he will be absent from Ireland's autumn internationals in addition to several Leinster games. First up, Moore, 23, will miss Leinster's opening European Champions Cup game against Wasps on Sunday. Tadhg Furlong will be available for Sunday's game after missing the win over Zebre in Italy. Furlong sustained a bang to his head in the defeat by Munster and was a late withdrawal from the game in Parma. Mike Ross, Dominic Ryan, Sean Cronin and Eoin Reddan, who were not involved against Zebre, are back in contention for the visit of the two-time European champions. Zane Kirchner, Rob Kearney, Noel Reid, Richardt Strauss and Jack McGrath all came through last week's game unscathed in what was their first game back after various injuries. 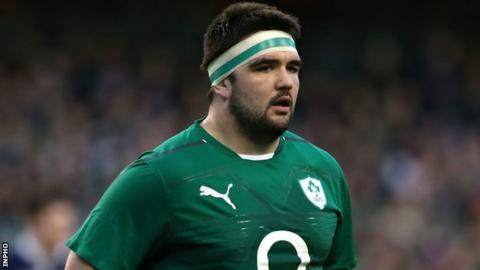 Prop Moore, who has five Ireland caps, underwent shoulder surgery on Tuesday morning. Moore was regarded as Ross's main challenger for the tight-head prop slot in both the Leinster and Ireland teams. Leinster are also currently without Lions loose-head prop Cian Healy who has a hamstring injury. Healy looks likely to miss Ireland's autumn internationals while Sean O'Brien, Keith Earls, Donnacha Ryan, Fergus McFadden, Iain Henderson and Dan Tuohy are also ruled out of the games against South Africa, Georgia and Australia.